Welcome to the April 2019 newsletter. This issue covers the April 12 Kotlin DSL Webinar, Gradle 5.3.1 release, the new Gradle Logo, a new, faster CDN for China, the Gradle Event Tour, and some new content from the Gradle team. Gradle: One technology to build them all - a webcast from Baptise Mesta of Bonitasoft. Gradle Tutorial - Find Your Gradle Dependencies - a quick video from Nate Ebel showing you how to use a Gradle build scan to view dependencies. A Better way to Manage Gradle Build Script - a blog post by Birju Vachhani going over how to convert to using buildSrc and the Kotlin DSL to manage Android dependencies. Mono-repo build with Gradle - a blog post by Baptiste Mesta explaining how he solves the sub-tree synchronization problem common in a monorepo environment. The author is looking for feedback on how other monorepo organizations tackle this problem. Asciidoctor Gradle Plugin 2.0 with support for Asciidoctor 2.x. Apache Netbeans 11.0 which is the first version released with Gradle support. Enterprise Groovy Gradle Plugin 1.0 a plugin to setup good practices when developing Groovy applications. If you have a talk or blog post you’d like us to share in the next issue, use #gradle on Twitter or send us an email with the details to newsletter@gradle.com. The Gradle Jenkins Plugin has exceeded 157,000 installs surpassing the popular Maven Integration Plugin which has just over 148,000 installs. Like any download statistic, this should be taken with a grain of salt, but congrats to both plugins for being in the top 75 most installed plugins on servers that authorize jenkins.io to collect usage statistics. If you are still experiencing slow Gradle distribution downloads in China, or have questions about Gradle in general, please raise an issue on the Gradle forums. You may have noticed our new logo in this newsletter and other recently published Gradle materials. 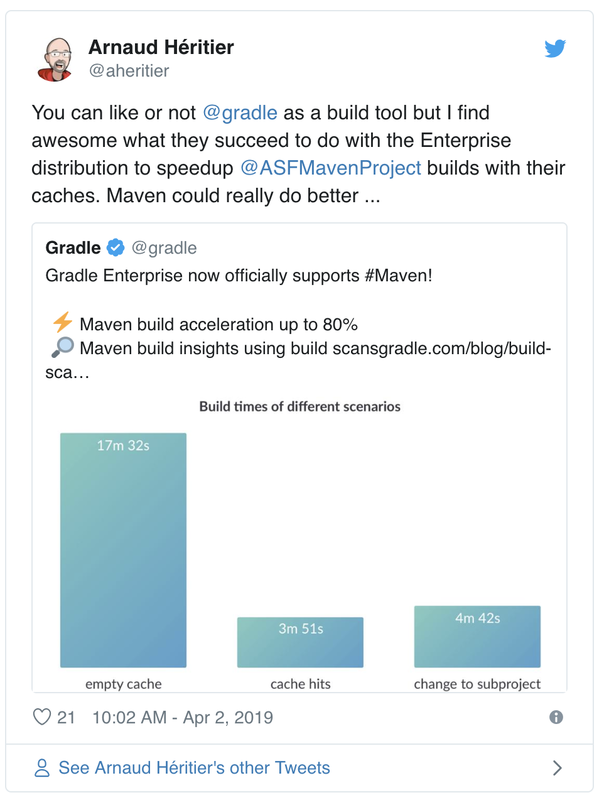 If you need to update your blog posts, conference talks, or Gradle plugin website, you can download the new logos for Gradle Build Tool, Gradle Enterprise, and the Gradle Elephant at gradle.com/brand. To update your laptop stickers, find us at an upcoming event. In the last newsletter, we talked about the 5.3 release candidate. Since then, we released 5.3 and 5.3.1 which includes some important fixes notably a fix for multi-project builds. As with all releases, please upgrade to the newest version. As you may have noticed from our growing Upcoming Events sections in the last few newsletters, Gradle is doing a lot more local events including some stops of the NoFluffJustStuff(NFJS) and CloudBees Days series. 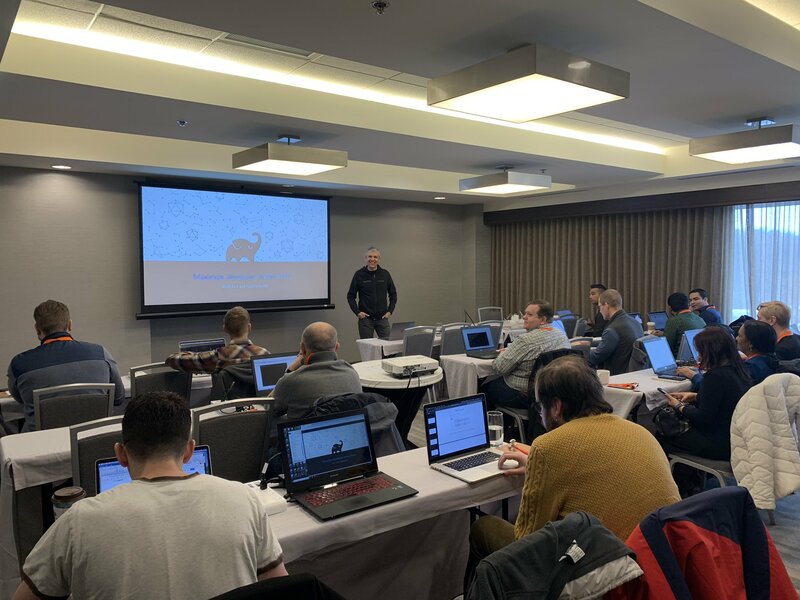 At these events, we will deliver an interactive workshop Maximize Developer Productivity with Fast and Reliable Gradle and Maven Builds where you will solve common build process and developer productivity problems on both Gradle and Apache Maven builds in a Gradle Enterprise training environment. If you are in one of the cities listed below, we may reach out to you for special discounted or free event tickets so please add us to your inbox contacts to avoid those messages going to the spam folder. If not, stay tuned to find out about more events near you! April 12: Webinar: Getting Started with the Gradle Kotlin DSL - Gradle Engineers Paul Merlin and Rodrigo B. de Oliveira in an official online Gradle webinar. April 16: Gradle für Java Entwickler (Deutsch/German) - Gradle Engineer Benedikt Ritter at JUG Essen. April 23: Gradle with Ketchup - David Lucas of Lucas Software Engineering at the GDG Android Columbus. April 26: Fast and reliable builds with Gradle and Maven - Gradle Engineer Marc Philipp at JEEConf in Kyiv. April 26: DocuOps & Asciidoctor (Inglés/English) - Schalk Cronjé, Independent Consultant, talking about the Asciidoctor Gradle Plugin at the Madrid Groovy User Group. May 9: Wiederbelebung von Legacy-Projekten mit Gradle (Deutsch/German) - Dmitrij Drandarov of msg DAVID at the Hamburg JUG. May 17: Managing Dependencies for Spring Projects with Gradle - Gradle Developer Advocate Jenn Strater and Andy Wilkinson of Pivotal at Spring IO in Barcelona. May 20-21: Introduction to Gradle - official online Gradle training. May 27-29: GR8Conf EU - Developer Advocates Andres Almiray and Jenn Strater will present on various Groovy and Gradle topics. May 30: Build Cache Deep Dive - official online Gradle training. June 4: Schnelle und zuverlässige Builds mit Gradle und Maven (Deutsch/German) - Gradle Engineer Marc Philipp at Karlsruher Entwickerlertag. The details of these and other open positions available at gradle.com/careers. If you have some news you’d like us to share in the next issue, use #gradle on Twitter or send us an email with the details to newsletter@gradle.com. Subscribe to stay UP-TO-DATE on new features and community news. © 2019 Gradle Inc. All rights reserved.